Sometimes hiring a professional is a fairly easy task. When you need a hairdresser, you may ask a friend for a recommendation. When you need a plumber, you might look at the sticker on your water heater and simply dial that number. Other times, you might feel a little overwhelmed at the prospect of hiring a professional. Unfortunately the latter can be the case when wondering if, and how, you should hire a graphic designer. I am writing this Q&A blog post in the hopes of uncloaking the task a little bit, and hopefully shedding some light on what may seem like a daunting, and perhaps unnecessary (eek!) task. I work for a company and we need a poster designed. One of our accountants did some design work for his college newspaper. Why would we hire a graphic designer when he can throw something together for us? While I’m sure your co-worker who has dabbled in graphic design could put something together for you, it doesn’t sound like graphic design is his specialty. He likely has a vague recollection of how to change the fonts in InDesign, and maybe even has an eye for composition. But, a true graphic designer doesn’t design for a hobby. A design professional designs full-time and has a firm grasp of what goes into a successful design. A design professional holds a degree in graphic design, meaning that not only does he/she understand the technology necessary to digitize an idea, they also understand how to take a problem and solve it visually—through conceptualization, collaboration, and composition. This results in a design that really makes a visual impact for your company or organization. I want to contact a graphic designer, but I’m intimidated. What if I don’t like what they design? What if I get the bill and it’s way more expensive than I planned? I can only speak for myself on this one. If you are thinking about hiring a graphic designer, your first step would be to send me an email, or make that quick phone call. I promise I'm friendly! I make sure that I have a good understanding of the project scope before I provide a potential client with a (free) project quote. That way there are no surprises when the final invoice is sent upon project completion. My main goal as a graphic designer is to visually communicate an idea for my clients. Therefore, I see each project as a step-by-step collaboration to make sure that I am communicating any and all thoughts and ideas throughout the entire design process. This results in a final design that my clients are completely satisfied with. This all sounds good, but you don’t have any prices on your website. Is hiring a graphic designer going to be a huge expense? I don’t include prices on my website because every project is different. I customize every thing that I work on to meet that particular client’s needs. One client might want an extremely simple business card, another client might want a letterpress business card, and another client might want two-sided business cards with a few different backsides. A different amount of work would go into each of those three types of business cards, and therefore there can’t be a set price. Hiring a graphic designer is an investment that can pay off if you hire the right graphic designer—someone who really takes the time to understand your needs and the talent to pull it off. I feel that my pricing is fairly competitive within the marketplace. As a freelancer with very little overhead, I am able to charge very reasonable rates. As a graphic designer with eighteen years of professional experience, I am delivering a quality product to every single client I work with. I was contacted this past spring about redesigning a logo for St. Francis Children’s Center in Glendale, Wisconsin. I’m always excited to take on a new client project, and this one was no exception. Not too familiar with the center, I was happy to meet with my client in person, and take a tour around. St. Francis Children’s Center provides services to children with and without special needs, and they are big on play-based learning. It’s a very safe, inclusive, and supportive environment which fosters social, emotional, physical, and academic development for all of the children that attend the center. It is also a very colorful, happy place. The kind of place that would truly be fun to design a logo for. They were looking for a logo that wasn’t too clunky, and not too cliché. This was going to be a very conceptual logo that hinted at a symbol. These are the most rewarding types of logos to work on, but they are also the most challenging. Lots of thinking time is required at the onset. Once back at my desk, I gathered all of my notes and my thoughts and began to brainstorm ideas. I wanted to really take that notion of inclusivity and turn that into the perfect logo for St. Francis Children’s Center. I really liked to notion of a nest as a safe and inclusive place. My first three concepts played off that idea—three different colorful, abstract nests. I also wanted to present a more literal idea of a pinwheel with the different colors coming together to form one entity—in the same way that the children all come together each day at the center. There was some back and forth, and adjusting, but in the end the client was happiest with the top concept. The bright blue, purple, and orange are bright colors that I had seen used in murals throughout the center. They are attractive to both adults and children, and not too childish. I experimented with some different fonts, different layouts, and different font colors. It was decided that black type would be the most legible. I selected a font with a nice presence, but one that isn't too styled or distracting. I really want the symbol to stand out, but I also don't want the type to be overlooked. The end result is the strong, conceptual logo that can be seen at the top of this post. It will hopefully serve this wonderful place well for many, many years to come. I was first contacted about designing a logo for Geiser, Bowman & McLafferty, LLC this past summer. GBMLaw is an Ohio based law firm that was going to be rebranding itself under their new name at the start of 2017. When I first spoke with my contact at the firm, she was pretty set on ideas for the logo. It was important that the new logo retained some of the old logo feel. This meant keeping a blue color palette as well as integrating an outline of the state of Ohio into the logo design. Like many states, the state of Ohio is a rather awkward shape to work with. Out of context, it isn’t necessarily recognizable and while it is rather compact, it’s not an even square shape. Working the shape of Ohio into the logo was probably my biggest challenge. I worked up a bunch of different logo concepts, all blue, and all incorporating Ohio. When I think of a law firm, I think of a serif font. It seems official and a little more serious than sans serif. But, sans serif fonts are clean and modern. Since this was a name change and a logo reworking, I wanted to try to experiment with both serif and sans serif and see what GBMLaw ended up choosing. As you can see, given the parameters, I was still able to come up with a variety of solutions to the problem. I experimented with the placement of the Ohio, even placing it behind some of the text in the second concept. I also experimented with integrating lines into the design. The fifth concept has the state of Ohio within a circle which gave it more of an icon feel and solved the issue of the odd shape of the state. After reviewing the concepts, GBMLaw decided to go with the fifth concept. At that point, I fine tuned the logo and created a second version with the partners' names below, as well as a couple of "formerly..." variants that could be used temporarily during the name change. In addition, I designed business cards, envelopes, letterhead, and web tracker ads that all tied into the initial logo design. The end result is a clean look for this rebrand and an easily identifiable logo that really stands out among competition. Maybe you are headed to one of the many marches this weekend across the country. Like most Americans, I have zero tolerance for hate of any sort, against any person--regardless of religion, race, nationality, gender, sexual orientation, etc. Zero tolerance. So, last month during a small break from work, I designed a poster that reflects this. I didn't spend oodles of time on it, but I think it gets the message across pretty well. I wanted to create a poster that harkened back to the 1960s, a time of radical change in this country. I used simple graphics, a hippie-ish font. There are a lot of posters being passed around this week. Feel free to pass this one around too, print it, and march with it if you'd like! Below is a link to the high-resolution 24" x 18" PDF. I’ve had the privilege of designing the Remarkable Milwaukee invitation suite for Historic Milwaukee, Inc. for the past three years. Each year at this wonderful event, an award is presented to a different Milwaukeean/group of Milwaukeeans. Therefore, I try to change up the design each year to reflect that particular year's winner(s). 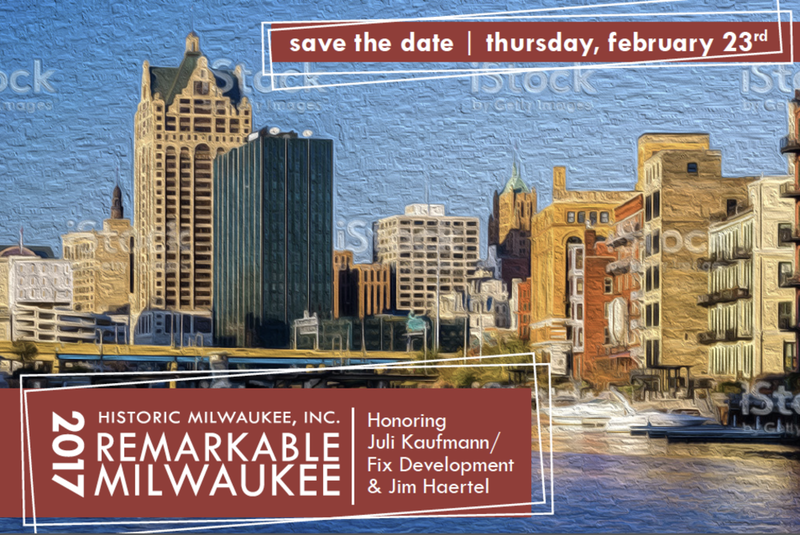 This year, the award is being presented to two individuals who are working on preserving some of Milwaukee’s historic buildings, Jim Haertel and Juli Kaufmann of Fix Development. Jim Haertel is the owner of the Best Place at the Historic Pabst Brewery. In addition to all the investments he has made at the Best Place, he and his wife recently purchased the Eschweiler school building in Wauwatosa. Some of Juli’s projects include the Innovation and Wellness Commons in Lindsay Heights, Clock Shadow Building in Walkers Point. As I began coming up with ideas for the save the date postcard, I wanted to try to integrate that floor tile into at least one of the concepts that I would present to HMI. I did some sketching, but moved over to the computer pretty quickly for this project. I did a bunch of pretty quick computer “sketches” before I settled on my top six ideas. Yes, six. I maybe got a little carried away on this one, but the ideas just kept flowing. Below are a few of the six ideas that I presented to HMI for the save the date. Some of the ideas would carry over right into the invitation itself. A few of the other ideas would be separate, but somehow relate to the actual invitaiton. I wasn’t sure if I would have the time and skill needed to replicate the tile floor pattern exactly how it was in the building. So, I found a simpler pattern that would convey my concept without being so literal. I presented a gamut of ideas. Some were very straightforward, others were a little more complex, some incorporated the tile floor pattern, and others did not. HMI, never one to shy away from my more “daring” ideas (that's one of the reasons why I love them! ), chose my favorite concept. This one integrated the floor pattern, and some of the historic photos that I found during my initial research. I think of this design as fun, and even a little edgy. That cursive font is a little unconventional, as is the layout. There were very few design changes from initial concept to final design on the save the date. Once that was complete, I moved on to the invitaton, reply card, and envelopes. All of the items share design similarities. 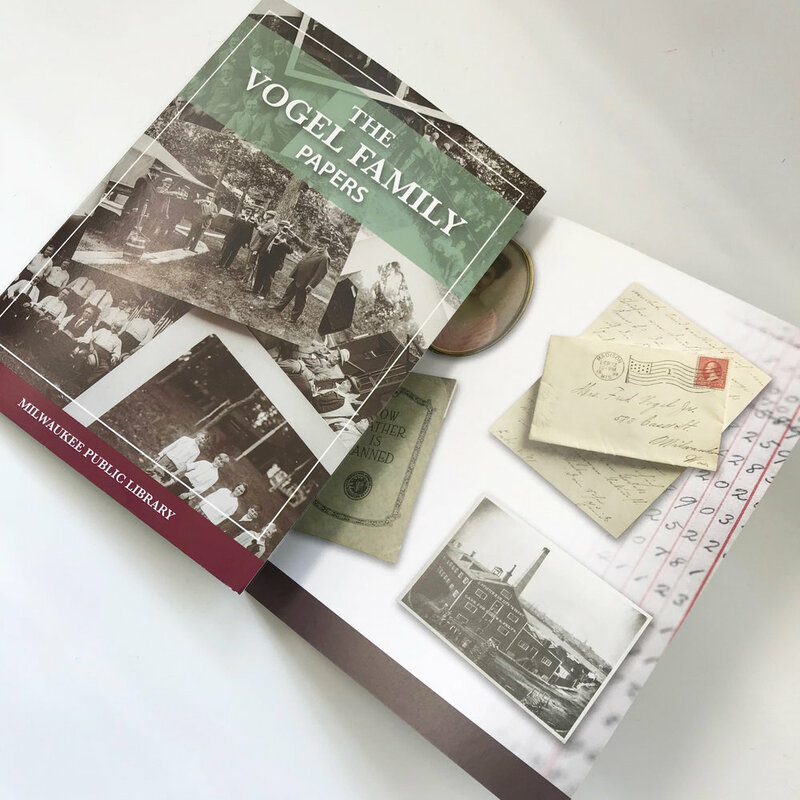 Even though the save the date postcard was printed on glossy paper, and the invitation suite was printed on matte, the package is obviously related and recognizable as the look for this year’s Remarkable Milwaukee event. You probably will think that I am just saying this to say it, but I will say it anyway, and I will mean it. This is one of my favorite projects I have ever worked on! Logos can be so tough, in my opinion, logos are the most difficult of all of the graphic design realms. A designer needs to create one easily recognizable, visually appealing mark that represents an entire entity. That's a logo. When the Greater Atlanta Modern Quilt Guild approached me about creating their logo, I was pretty psyched. Who doesn't love quilts, and if you Google "modern quilts" as I did, WHOA! A graphic designer's fabric dream come true. These quilts are bold, colorful, eye-catching, and completely gorgeous. In conversations with my client, I learned that they were looking for a logo that represented modern quilting, but also represented Atlanta. Reading between the lines, I knew exactly what this meant: THE PEACH. This was the first, and only, time that I winced during the project. I mean, have you ever been to Atlanta? Every other street is named after the peach tree. Really, what other way is there to represent this beautiful city, aside from the peach tree? Well, my client did mention highways, so there was that direction as well. The highway direction was an interesting one because this is the greater atlanta guild, which encompasses a larger area than say, the Atlanta Quilters Guild. I began researching, which was completely fun. I took a few weeks to let the ideas flow, it so happened that during this time I was in NYC for a few days. I went to MOMA and kept this project in mind as I went from gallery to gallery. In particular, I focused on colors and left the museum with some neat color combination ideas for this project. The two ideas on the left are based off that quilt I had seen, the circular pattern, I decided, would be a perfect way to integrate the peach, without making the peach too obvious. I am fairly certain that there are zillions of companies/organizations in Atlanta that use a peach in their logo. My main mission was to use the peach in a clever, subtle manner. I really think that these two ideas accomplished that rather successfully. The idea on the top right is my highway concept. I used a pieced together highway, a nod to pieced together fabric in a quilt in this design, and wanted the road divider to double as a quilting stitch. The idea on the bottom right is the third concept. I had researched different modern quilting patterns and a lot of them were boldy colored free style type patterns made up of colorful squares. I thought it would be neat to do something like that and bring in an A for Atlanta. I sent the three drawings off to my client and waited for them to review the ideas. I was thrilled when they came back to me and said that they were thrilled with the peach concept that I had presented. We decided to go with the bottom layout, it is more contained for social media and looks a little more integrated with the type below the image. Their only concern was that the yellow of the background ellipses wouldn’t stand out. At that point, I went onto the computer and tested out some fonts and some different color ideas. I wanted a modern font, so sans serif was the resounding choice. I selected Futura for the font because it is so elegant and modern, just like the quilts. My client mentioned that they might want a blue color for the background ellipses, so once I ironed out the font, I tested a few shades of blue. The trick was trying to find a blue that nicely contrasted with the peach color of the peach, but didn’t share too close a value with the green of the stem. The blue in the middle logo below accomplishes everything perfectly, we had our logo! I am so excited for the Greater Atlanta Modern Quilt Guild to begin using this beautiful new logo! 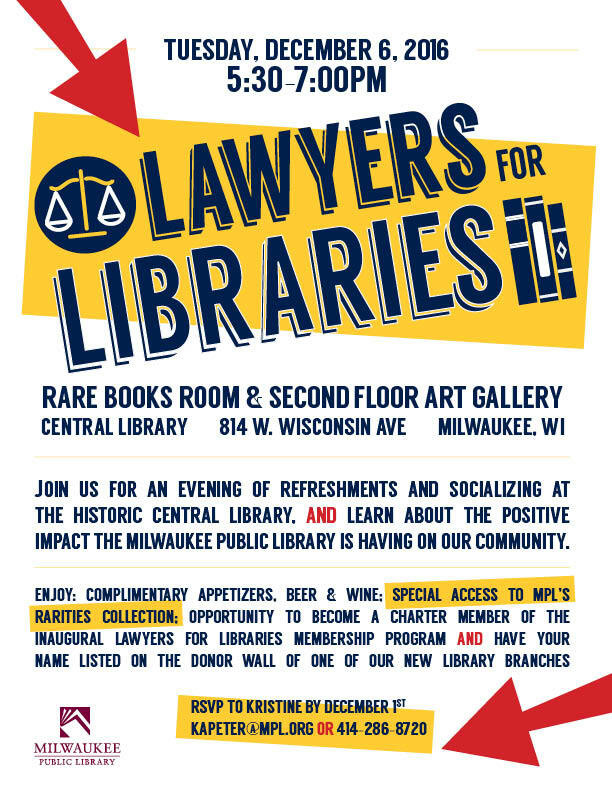 When one of my favorite clients contacted me last minute on a Friday about working on an invitation for their new Lawyers for Libraries program, I said, "SURE!". The catch was, they needed it done yesterday. I threw everything aside and threw all hands (well, two hands) on deck to make sure that they got it designed well, and on time. Typically when I begin the design process, I take the most time during the first stage. I refer to it as the conceptual stage, it's the most critical, most creative stage of my design process. Normally, I'll sketch some ideas in my sketch book. I'll think about the client's design needs for a few days. Basically, I do everything I can to give the ideas time to just flow. But, this project had such a tight turnaround, I didn't have that luxury. Of course, I still wanted this invitation to look fantastic! So, I dove right onto the computer and worked up some digital sketches. Basically, when I do this, I work on lay out ideas as quickly as possible, moving on to the next one when hit a dead end on the one I am working on. This yields a whole slew of really horrible looking ideas, but it also leads a few potential winners. The design on the left, the most conservative, is informative, and visually appealing. But, it is also very "safe." It's very straight-forward, and looks a little template-y, in other words--no surprises with this one. Because this is an invitation, MPL will want something eye catching, obviously the goal of this project is to get lots of people to attend the event. The middle design is unexpected. But, I considered the audience, nothing at all against lawyers, but perhaps this one is better suited for a concert crowd. It could be dismissed as non-professional, the font is a little hipster, the composition a little jarring. The design on the right, is a good mix of straight-forward, and also unexpected. The design is easy to follow, it's bold and eye-catching. There are still unexpected elements, such as the color choice and the header font, but it will appeal to the intended audience, and catch their attention. You might notice that the scales of justice are not included in this design. After working through the first two designs (and several other messy designs not pictured), I began to feel as if the scales of justice were a little cliché and expected. I decided that I could include the book illustration, and cover both bases--they could easily be law books, but obviously libraries also have books. 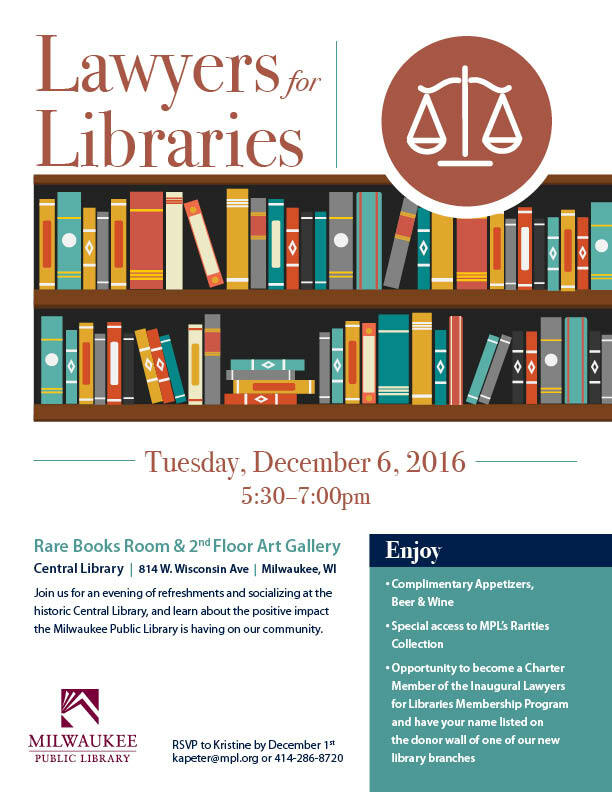 And since the event is called Lawyers for Libraries, why not cover both bases in one illustration. The end result is a cleaner design, and a narrower focus for the viewer's eye. 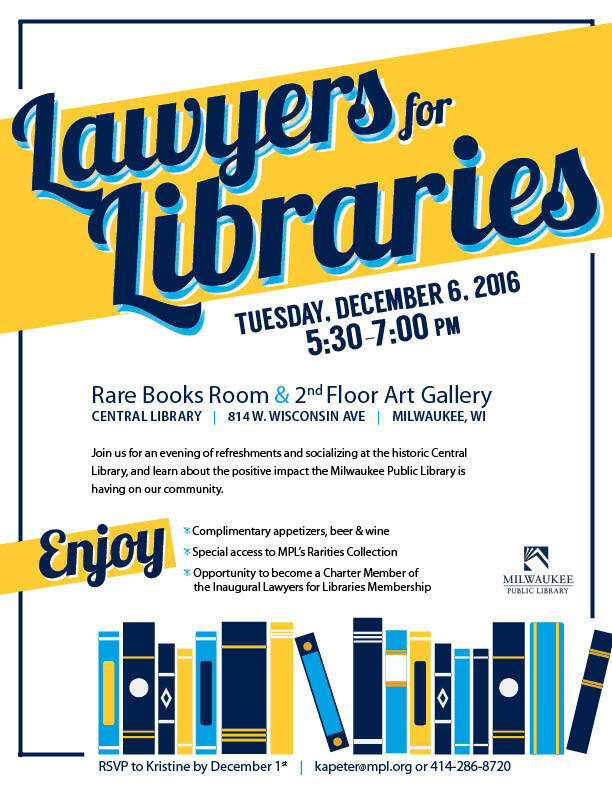 Here's hoping that lots of lovely lawyers attend this fantastic Milwaukee Public Library event!